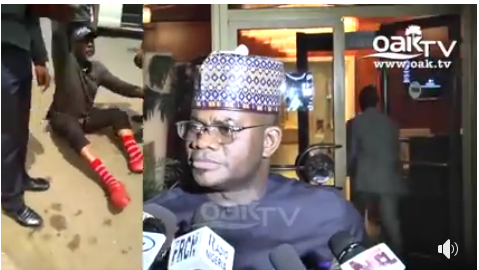 Kogi state governor, Yahaya Bello has finally broken his silence on the senator Dino Melaye’s arrest and recent ordeal at the hands of security operatives. Governor Bello and the lawmaker representing Kogi West senatorial district at the National Assembly, Melaye, have been at loggerheads with both accusing and counter-accusing themselves. During a recent All Progressives Congress APC meeting, governor Bello was asked by the reporters about the issue concerning one of the senators in his state. The governor replied by asking which of the senators. He was told senator Dino Melaye. ”I read it in the news and watched it on television as the law enforcement agencies are carrying on their lawful duty, that’s all I can say about that”, the governor said. Senator Dino Melaye was arrested last month for allegedly sponsoring and arming political thugs in Kogi state.